I'm a romantic at heart, so when I need some inspiration I call up a favorite story or a place I love and create a mood in my mind. 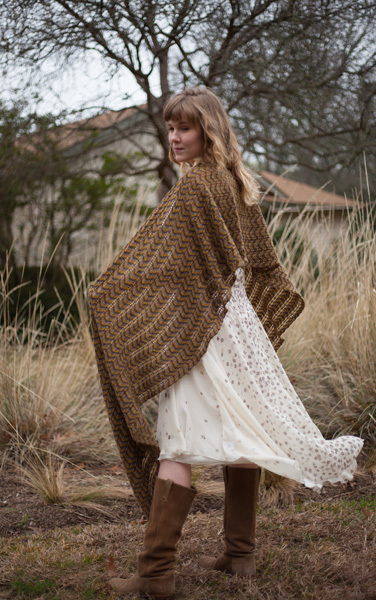 I try to design something that fits into the story or the landscape, a coat with cables inspired by the paths I hiked when I was growing up, or a shawl that Valancy Stirling would have worn on her way home to her island from The Blue Castle. When I have a mood fixed in my mind it allows me to build a framework to make decisions that will make the whole piece come together. I love anything economical. I have a terrible aversion to cutting yarn, so I often work Two-At-A-Time Magic Loop - socks, sleeves, fronts - so that I can work from both ends of one ball. I'd rather have something a bit larger and more unwieldy on the needles than have to knit the same thing twice in a row. It's important to me to have patterns that support a variety of sizes. I try to write garments for 7-9 sizes between 28" and 60". I learned to design years ago when I was working in a local yarn store, Lakeside Fibers, in Madison, Wisconsin. I loved helping knitters alter and tweak patterns, and found that I was doing it all the time for women in the larger end of the size range because people just weren't writing patterns for them at the time; many ended at a 46". I'm so pleased that trend has started to change in the last five years. I haunt Ravelry, but mostly for the forums. I keep half an eye on Hot Right Now, but when I see something I love I'm more likely to queue it to knit myself (as if I'll ever have time for recreational knitting again) than to wish I'd designed it. When I'm coming up with a new pattern I'm very thoughtful about tracking down the source of the inspiration in my brain and making sure that it really is my own idea. With lots of my patterns, one led to the idea for the next, so I don't have to worry in those cases. I knit all of my samples. Absolutely. I am an incredibly pedantic and meticulous person (about knitting, don't ask the laundry basket about me) and my tech editor still finds things in every pattern. Katherine Vaughn has been editing for me recently and I am delighted with her work. Good tech editors are irreplaceable. Not very well, but for right now I'm okay with that. I work almost all the time, but the job is so varied when you do everything yourself that there's always something different on the horizon. I did start running last fall, and more than anything else that has helped me keep a grip on things. If I can make time to run a couple of times a week things can't be that bad. I went to school for textile art and we used to have to stand at the front of the class while the other students critiqued our work. I haven't run into anything in the knitting world worse than the first Crit for Sculpture 1! Mainly though, I listen. If something in a pattern is incorrect or confusing, I correct or clarify. If someone just doesn't like what I do, fortunately for her there are about 36,000 other people on Ravelry designing patterns. I know not everyone is going to like my stuff, and I'm mostly okay with that. Be as professional as possible right from the start. Study up, create a style sheet (a guideline of the way you're going to write your patterns) and stick to it. Some places (like Knitty) post their style guides online so you can see what good guides look like. Knit a lot of patterns from people whose design work you respect and zero in on what you like about their patterns - not just the knitting, but how the actual physical pattern explains things and lays them out. Do not just copy explanation or layout, but take time to come up with your own way. There are lots of moving parts to being an independent designer - you're going to need to either be good at photography, get good at photography, or pay someone else to be good at photography. There are lots of tutorials and classes out there to help. You're also going to need a model, unless you are going to be your model. I lucked out and my model is my sister. If you promise a publisher or yarn company that you'll have something ready by X date, have it ready. Reply to emails in a timely fashion. Do not disappear off the face of the earth. Find a good tech editor (Ravelry can help you with this) and pay her right from the beginning. If you go over your patterns with a fine tooth comb beforehand and send them with all information completed, most TEs won't need that much time to edit and it'll probably cost between $10 and $35. Most will give you an estimate and if they're going to go over they'll stop and email you first. If you think you can't afford this, wait until you can; it will be worth it in the long run. Don't release too many free patterns. They generate tons of support requests and other people won't value your work if you don't. Don't be too intimidated. There are lots of resources out there to help and lots of people willing to answer questions. My experience so far has made it clear to me that if you're professional, have good ideas, and place value on building your skill set, people will root for you. There are plenty of knitters out there, and we can always make more.